I want a way to trigger the camera automatically upon an event. It should be flexible enough to handle multiple sensors (IR, Laser, Sound) as well as for various purposes (high speed, wildlife, etc). I want it to be small and run relatively fast for the high speed application, but also to have filtering to avoid false trigging during wildlife use. 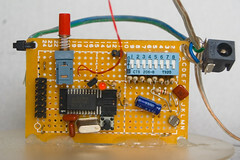 The system uses an MSP430F1132 to sample a sensor line using an ADC. There are two modes with two subsettings. Wildlife mode filters the data heavily to avoid false triggers. High speed mode only allows a single trigger and sets a very sensitive threshold value. Make and break modes are available for each setting. The threshold values are currently not programmable in the field (they're hard coded in the firmware). So far the system works with IR triggers (only for wildlife mode as the system is too slow for high speed), laser beam triggers (best for both) and sound triggers (really only useful for high speed mode). 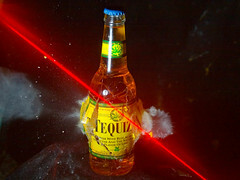 In high speed mode, the auxiliary power is cut off after a trigger is detected to avoid laser spill in the photos if using a visible laser. 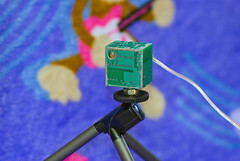 The visible laser pointer is powered by the board. In wildlife mode the laser is always on, but in high speed mode the laser will turn itself off after a trigger to avoid laser spill in the photos. The detector is a PIN photodiode of unknown specification. I found it during a lab cleanup at the university. Someone said "This has something to do with lasers.. I think.." It does a very good job of detecting red / IR lasers. 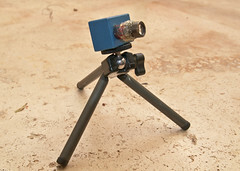 The IR laser is great because most modern cameras sensors have small pixels and are insensitive to IR light. Even at 300mW which is how powerful the diode I use is. The brightness ensures easy alignment and solid signal through the noise of the HV switching power supply. 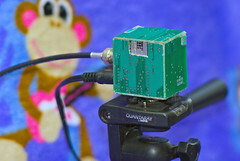 The detector is the same for the visible and the IR sensor. 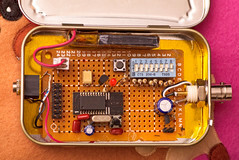 The IR emitter and detector were an experiment into low-power sensors that were invisible to humans. 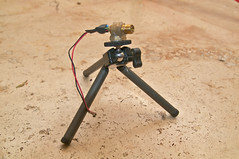 Speed was not an issue so the transmitter PCM modulates an LED at 2kHZ on a 44kHZ carrier. The detector sees this signal and triggers on a beam break or make. This is useful for wildlife traps where the camera may be unattended and theft is always a concern. I hate mic triggers, but honestly they DO have an application. 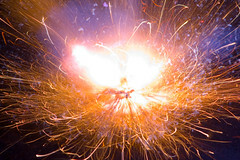 Its a lot of iterative fine tuning and hit and miss but for some items it is useful, for example, firecrackers. If I would add or change one thing it would be on-the-fly threshold programming. 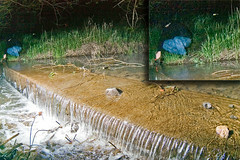 Either a pot or a digital interface could really make the process less painful, especially under less than optimal conditions (like when working across a stream to capture animals crossing a dam).